Climatic variability like precipitation changes or increase in extreme events such as storms and tropical cyclones is known to significantly modify the Earth's surface. Yet, our understanding of how sediment dynamics and reef evolution might respond to these changes is still limited. In a recent study, a team of researchers from the University of Sydney's School of Geosciences has designed a new model that simulates sediment transport from mountains to coasts, reworking of marine sediments by wave-induced currents, and development of coral reefs. Using the Great Barrier Reef as their study case, they estimated the evolution of the region over the last 14,000 years and showed that (1) high sediment loads from catchments erosion prevented coral growth during the early phase of sea level rise and favoured deep offshore sediment deposition; (2) how the fine balance between climate, sea level, and margin physiography enabled coral reefs to thrive under limited shelf sedimentation rates at 6,000 years before present; and, (3) how over the last 3,000 years, the decrease of accommodation space led to the lateral extension of coral reefs consistent with available observational data. 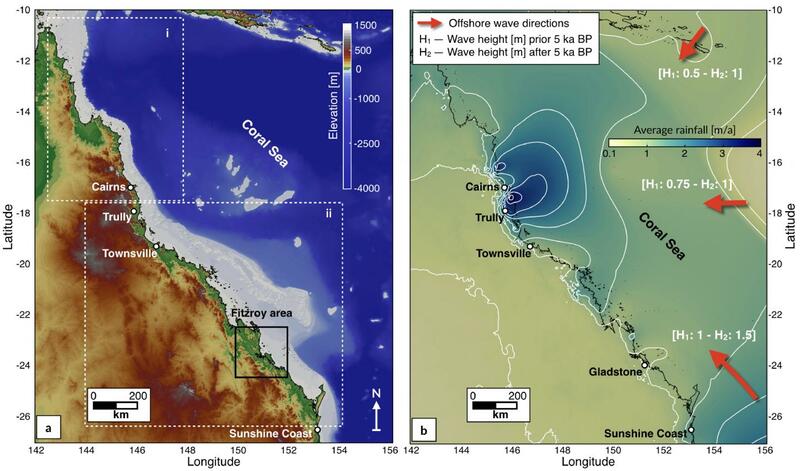 By validating model results against geological observations, the study indicates that changes in runoff, sea level and wave energy have profoundly affected the past evolution of the Great Barrier Reef not only in regard to reefs evolution but also sediment fate from source-to-sink. Even though the actual rate of global warming far exceeds that of any previous episodes in the past 14,000 years, large changes in global climate have occurred periodically throughout Earth's history. Knowing how these past climatic changes have altered sediment transport from landmasses to coasts and how sediment accumulation influenced reef development help to identify specific patterns and improve future predictions. The new proposed model could allow a better quantification of the impacts that will likely occur under changing climate and could be considered in future ocean resources and land use management.